Background: stroke is a disorder of nervous system function that occurs suddenly and is caused by brain bleeding disorders that can affect the quality of life physical dimensions, social dimensions, psychological dimensions, environmental dimensions. Based on the result of Lumbu study (2015) the number of samples were 71 people collected data using the (WHOQOL-BREF). There were 56 people (78,9%) had the poor quality of life of post stroke. The mean of post-stroke quality of life domain was physical domain (45,27%), psychological domain (49,87%), social relations domain (48,15%) and environmental domain (50.01%). Objective: the purpose of the study was know the quality of life of the stroke patients in Outpatient Polyclinic of Private Hospital in Yogyakarta. Methods: used descriptive quantitative by using questionnaire test of purposive sampling system based on patients who have been affected of ischemic or hemorrhagic stroke before, number 30 respondents. Result: quality of life of stroke patient of medium physical dimension (67%), psychological dimension (71%), social dimension (67%), dimension good environment (63%). Conclusion: the quality of life of stroke patients of physical dimension, psychological dimension, and moderate social dimension, while the quality of life of stroke patients were good environmental dimension. 2. Wibawa, E. A., Kuntjoro, T., & Pinzon, R. T. Kepuasan Pasien Stroke Peserta JKN di RS Lestari Raharja dan RSUD Muntilan Kabupaten Magelang. 2016, Hal. 257. 3. Kulshreshtha A, Anderson LM. Stroke in South Asia: A Systematic Review of Epidemiologic Literature from 1980-2010. Neuroepidemiology. 2012. 4. Bays, C. L. Older Adults’ Description of Hope After a Stroke. Rehabilitation Nursing. 2001. 5. Kwok T, Lo RS, dkk. Quality of Life of Stroke Survivors: A 1-year follow-up study. Arch Phys Med Rehabil. 2006. 7. Patel, M.D., McKevitt,C., Rudd, A. G., & Wolfe, C. D. Clinical Determinants of Long-Term Quality of Life After Stroke. Age and Ageing. Maret 2007. 8. Lombu, K. E. Gambaran Hidup Pasien Paska Stroke di RSUD Gunungsitoli. University of Sumatera Utara Institutional Repository (USU-IR). 10 September 2015. 10. Prince, S. A., Wilson, L. M. Patofisiologi: Konsep Klinis Proses-proses Penyakit. Dublin: EGC. 2006. 11. Steigelman, L. K., Kimble, L. P., Dunbar, S., Sowell, R. L., & Bairan, A. Religion, Relationships and Mental Health in Midlife Woman Following Acute Myocardial Infarction. Issues in Mental Health Nursing. 2006, Hal. 171. 13. Rambe, A. S. Stroke: Sekilas tentang definisi, penyebab, efek, dan faktor risiko. Departemen Neurologi FK-USU/RSUP H. Adam Malik, Medan. 2015, Hal. 196. 14. Nugroho. Keperawatan Gerontik & Geriatrik. 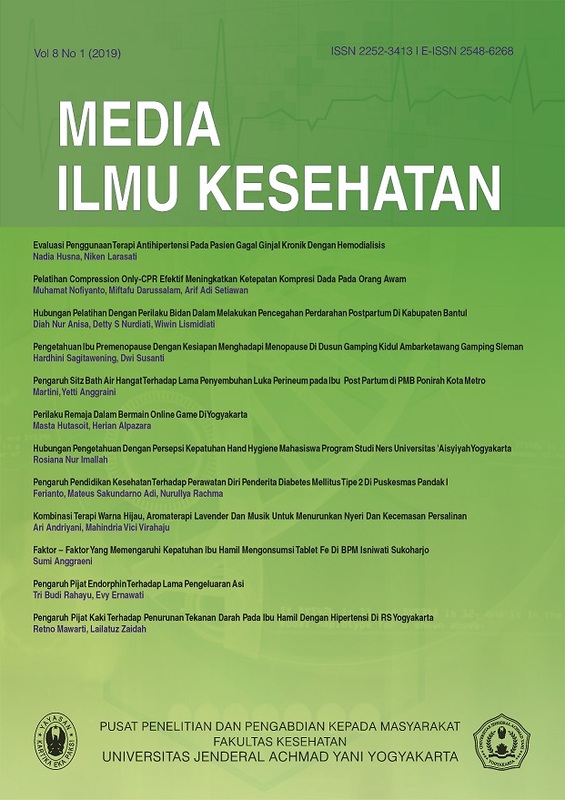 Jakarta; Penerbit Buku Kedokteran EGC; 2008. 15. Handayani, D. Y., Dewi, D. E. Analisis Kualitas Hidup Penderita dan Keluarga Pasca Serangan Stroke (Dengan Gejala Sisa). Phsyco Idea. 2009.